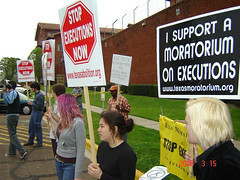 The photo shows students protesting the execution of Tommie Hughes on March 15, 2006. The audio post contains a speech by Renny Cushing, executive director of Murder Victims’ Families for Human Rights. Renny came down and spent three days with the students of Anti-Death Penalty Alternative Spring Break. In addition to going on the bus trip to Huntsville to protest the execution on March 15, Renny participated in a panel at the capitol on Thursday, March 16. Thanks, Renny, for traveling all the way from Boston to Austin and to Huntsville to be a part of the 2006 spring break!